brian's post of Adam Savage making a Wookie bandolier got my creative juices flowing. I've been tinkering with Raspberry Pis lately (spent last night getting a touch screen working and an USB FM receiver to make noise) and I chatted with my son today about his maker space work on some fun CNC and 3D printer projects. I'm not much for a wood worker but I'd love to make a TV stand out of reclaimed wood and old iron works. What kind of things are you gentlemen working on? Did two picture frames out of pickets. Pretty cheap. Turned out nice. Made my next batch of beer and beer bread. When The Wife decides what picture she wants framed I'm going to make another picket frame. But this time I'm going to halve the pickets lengthwise to make a smaller frame width. And still working on my photography skills. Picked up another couple of Scott Kelby books and joined Shutterstock to put up pics. So far, 9 rejections. So I've got that going for me. Which is nice. I need to brew another batch. My son got me a gift card to the local home brew store and I need to spend it. Was going to do a dark winter saison but we're heading into spring so I might pick another recipe. Do you have a lot of wood working equipment? I don't but I'd love to tinker more. I have a bunch of pictures and some I really like Staples had a good deal on canvas printing and mounting so I did three. Maybe this fall I'll enter them in the fair. Don't really have "wood working" equipment per se. Just an electric jig saw, drill, sander, skil saw and assorted files and such. Had them for years. 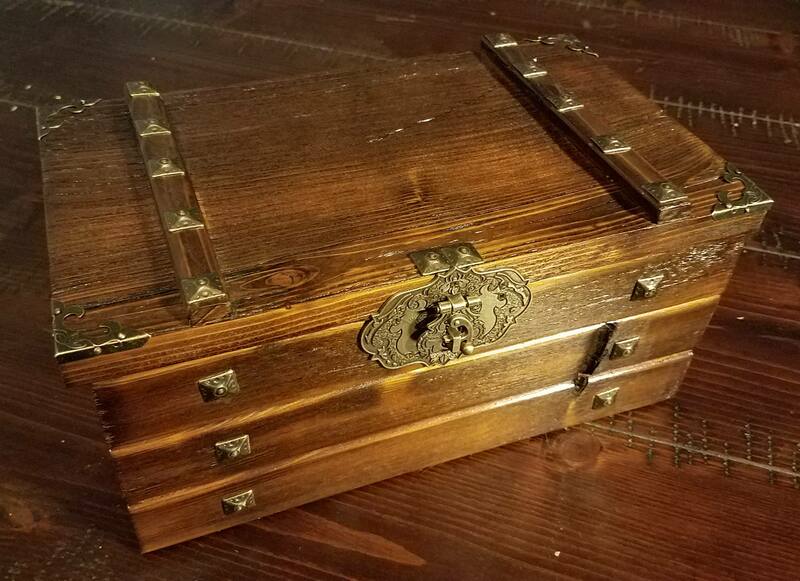 Can do basic wood working/fixing. And it's not like I'm avoiding work. I've been off since October waiting for my FAA medical to be approved. Got it last week but alas my 5 week rotation is up so I'm off for another 5 weeks. I've got cabin fever like crazy! DAMN IT MAN, GO BUILD SOMETHING!! Quick before the madness is irreversible! I took the left over pickets from the frame projects and was going to make a smaller frame when I saw a picture of a bar and the list of beers on tap was on a chalkboard made out of old wood. So I sanded the last three pickets and made a small chalkboard. When I click the link, it tells me the content is no longer available. Try this. I renamed the photo album. Still not working. I bet your settings are such that only your FB friends can view it. You would have to change that setting to public (everyone). Be careful with that, as it could possibly allow anyone to access that album/pictures and give them the ability comment. Not certain about that but you might look it up before changing the setting. I opened just that album. 3rd times a charm! Ta-da! The frame looks great. Attempt to weld a meat smoker. Brew another batch of beer. The first one is slightly more daunting. Fortunately, I think a buddy can help me with welding, and I can rent the equipment from Home Depot. Welding. Impressive. Never tried it. A friend is going to give me a freezer. I'm going to build a temperature regulator for it and turn it into a fermenter. Projects just come along. I have several that I am planning but only one started. Build a custom 12' outdoor dining table for the back patio, complete with built-in drink holders and removable serving trays. Thinking about refacing the kitchen cabinets with new doors and paint to make them a little more modern. Build sliding barn doors for my home office which currently only has door openings. In March we will be plowing up the food plots at our deer camp in preparation for turkey season this April. 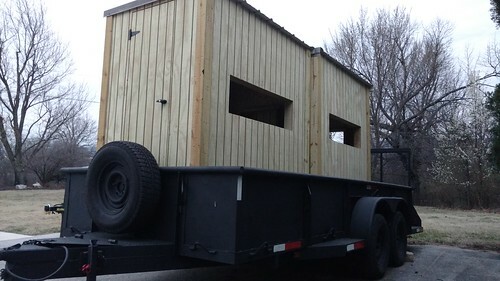 We will also be installing new box blinds to be used next deer season (these suckers are big enough to hold a recliner). Cleaning out the entire garage and reorganizing it completely. Started that yesterday. Building a wood and iron pipe coffee table as well as some bookshelves for a meeting room at work. This will match the standing desks I built for that room last year. 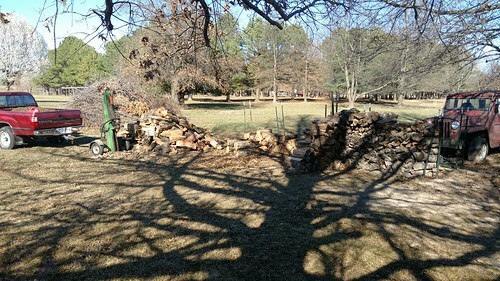 Finish cutting firewood for next year. I like to let wood season for a year so that it burns well the following winter. HA! I will be fortunate to actually get any of these things done. I always have more ideas than I do time. Update (02/27/17): Got most of the firewood split. Still need to cut and split a little more and then stack it. Some of this belongs to a neighbor as well. Also picked up the box blinds this weekend. Now we just need to paint them and get them ready to install at deer camp. Remodeling the master bathroom. We're thinking about doing a heated floor. Anyone have any experience or tips with heated floors? I have never installed one but looked into it once some time back. I recall reading somewhere that the electric version is easier as a DIY project than the water-based system. If we ever build a house or renovate a master bath, I definitely ant to consider putting a system in. I have gone headlong into Ham/Amateur Radio of late. I broke my foot on New Years and all the sitting still (I don't do that well still) had me focus my energy on a bucket list hobby of getting my Ham license. There are three levels of license that give you more access to more bandwidth. I passed the first two levels on the first try. It has opened up a pretty amazing hobby for me. Anyone that has any sort of interest it is a very broad hobby please I would be happy to tell more. In Arkansas, you can get a special license plate for your car that has your ham radio ID. Not sure if they do that in all states but you might look into it. Could be a good way to "advertise" your handle. My wife and I are making a bar cabinet out of an old radio. The original plan was to include some LED lights on a microcontroller, but there have been some setbacks on that front so we shall see. Wow, that sounds pretty great. There's nothing like the design of an old radio, in my humble opinion. That is a great idea. 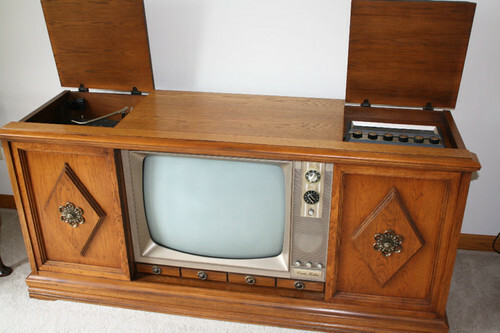 I always wanted to make a fish tank out of one of those old, giant console TV/stereo combos from the 70s. But I wanted to keep the stereo portion intact. Mixing water and electronics is probably not a good idea and the fish likely would have died from stress because of music pulsating through the tank. Nevertheless, it seemed like a good idea that simply never saw the light of day. Guys, I totally forgot to tell you what project I'm actually working on at this time: a handlebar mustache. It is coming along fine. 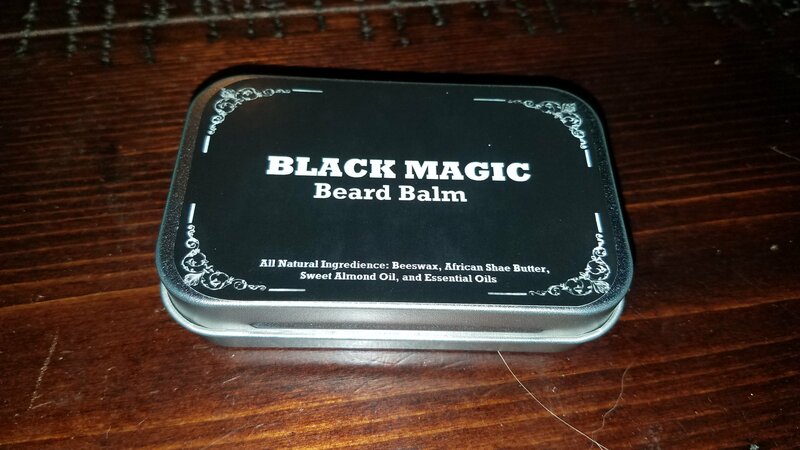 My wife isn't to crazy about it and it has received mixed reviews from my friends but I like it so far. I am letting my hair grow out. It is getting pretty long (for me) but nowhere near rock star status yet. I turned 50 recently and I am fortunate to still have a full head of hair so I thought, why not? I figure I will let it go as long as I can stand it. More than likely, the heat and humidity of the Arkansas summer will make me cut it off. My wife likes it so, there's that. I can add to this one. 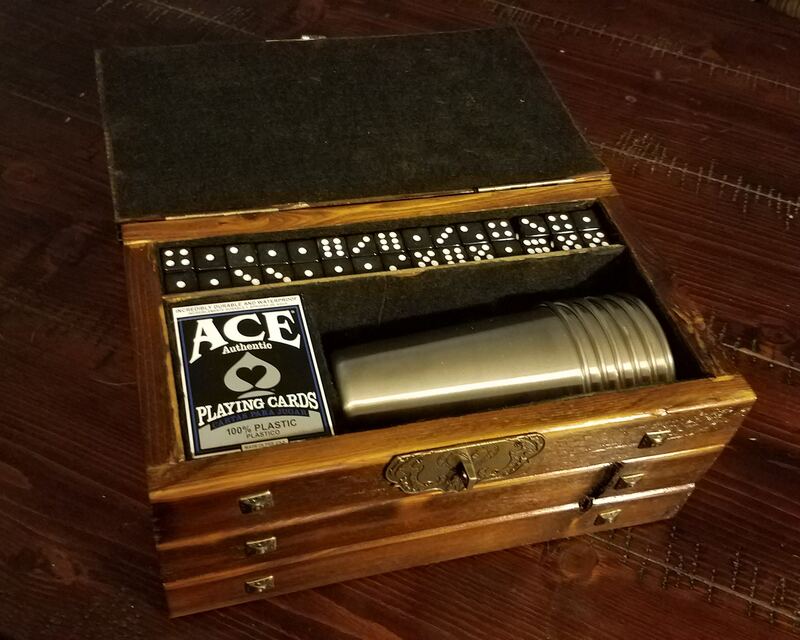 During a camping trip last June I decided that I needed to build some type of case for liars dice. 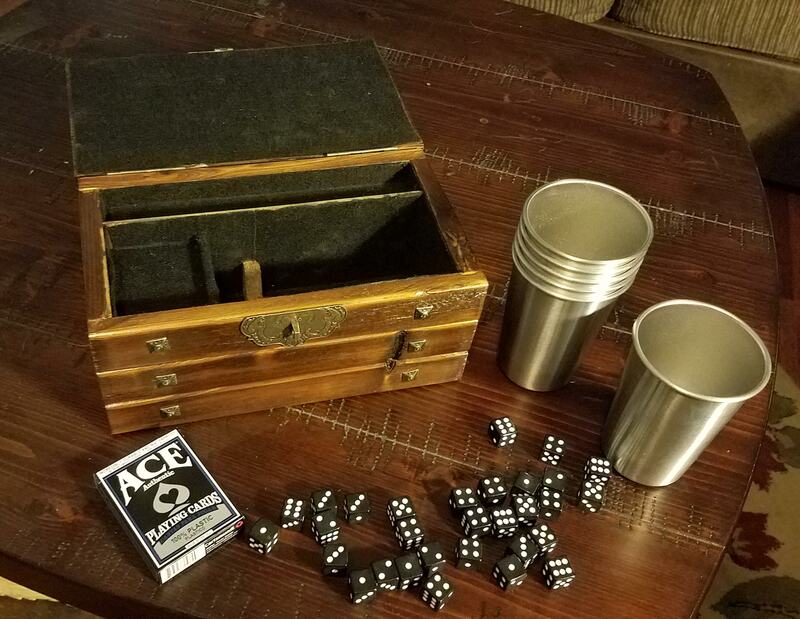 When I got home from the trip I got on Amazon and bought some brand new stainless steel cups and a huge pack of 100 black dice...... and they sat on my work bench for 3 months. Now that the heat is nearly gone, and my garage is no longer hotter than Satan's armpit, I decided to build that lairs dice set.